One of my favorite historians and authors is Alison Weir whom I discovered by accident back in the 1990's when I read, 'The Six Wives of Henry VIII' simply for pleasure then later for a college history class. Thus, she started me on my road to historical biographies! Title 2 taken from Amazon.co.uk: "Mary Boleyn: The Truth About Mary Boleyn" Publisher: Jonathan Cape (6 Oct 2011). Title 3 taken from amazon.com: "Mary Boleyn: The Mistress of Kings" Publisher: Ballantine Books (October 4, 2011). Mary Boleyn has gone down in history as a 'great and infamous whore'. She was the mistress of two kings, Francois I of France and Henry VIII of England, and sister to Anne Boleyn, Henry VIII`s second wife. She may secretly have borne Henry a child. It was because of his adultery with Mary that his marriage to Anne was declared invalid. It is not hard to see how this tangled web of covert relationships has given rise to rumours and myths that have been embroidered over the centuries, and particularly in recent years, so that the truth about Mary has become obscured. In all my years of writing women's histories, I have never tackled a subject who has been so romanticised, mythologised and misrepresented. Everyone knows Henry VIII as the King who married six times. His matrimonial adventures have been a source of enduring fascination for centuries, and the interest shows no sign of abating. Yet comparatively little is known or understood about Henry`s extra-marital adventures, and most people have the wrong idea about the woman who is now the most famous of his mistresses, Mary Boleyn. Was she really a 'great and infamous whore' with a notorious reputation? Is it true that Henry VIII was the father of her children? I am often asked these and numerous other questions about Mary, and am constantly being made aware, not only of various misconceptions that are accepted as facts by many, but also of the views of many others who are well-informed on the subject and are wondering why Mary Boleyn is so misrepresented. It is for these reasons - and because I have done a lot of unpublished research on her over four decades - that I have written a biography of Mary. 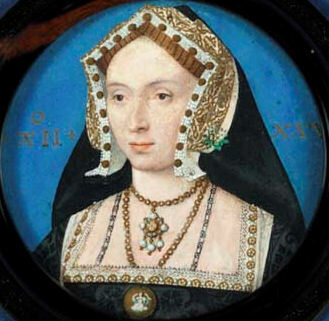 Mary Boleyn represents only one short episode in Henry VIII`s chequered love life; all we can say with certainty is that she was his mistress for a short period while he was married to his first wife, Katherine of Aragon. Mary`s true historical significance - and importance - lies in the implications of her royal affair for her more celebrated sister, Anne Boleyn. My interest in Mary, and my research, goes back to the 1960s, when she was regarded as little more than a footnote to history. Since then, I have written about her briefly in three books, 'The Six Wives of Henry VIII', 'Henry VIII: King and Court' and 'The Lady in the Tower: The Fall of Anne Boleyn', while my unpublished research comes from my extensive original version of 'The Six Wives of Henry VIII', completed in 1974. There is no escaping the fact that an air of mystery pervades every aspect of Mary Boleyn`s life. 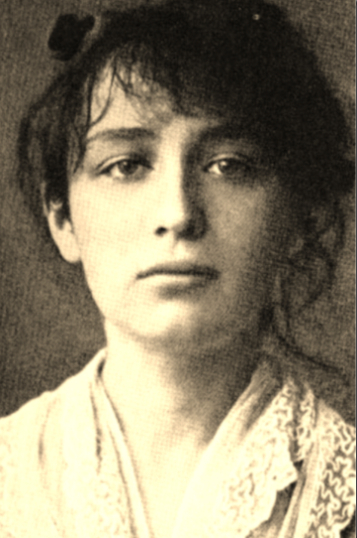 There is so much that we don`t know about her, and only so much we can infer from the scant sources that have survived. She is in the shadow of her famous sister in more than one way. It is the persistence of the mythology surrounding Mary Boleyn that has been the most disconcerting aspect of my research. For much of what we might read about Mary, even in history books, should be treated with caution, based as it is on false assumptions and what might be termed 'urban myths'. For this reason, this book is not only a biography but also a historiography of Mary Boleyn. What follows is a tale that has never fully been told, a rigorous assessment of what we know - and don't know - about Mary Boleyn, which hopefully will enrich our understanding of this much–misrepresented lady and her relations with Henry VIII. 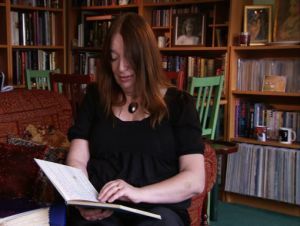 Another piece of Alison Weir information obtained from her website is based on a UK television appearance she did in November 2010 on a show called, 'The Book Show (The Write Place). However, the video would not play in the states so instead I have a written transcript in Alison Weir's own words that I hope you find as enjoyable as I have. 'I’m sitting in my house in Carshalton in Surrey; it’s a lovely peaceful place in which to work. It’s wonderful to have a room like this as for the first time I have all my books in one place. This is my history library, all the books are filed around the room in chronological order and most of them are history books about the British monarchy. Reference books are by my desk, behind there are art books, costume books, records – I’m a collector of rock music and memorabilia - and DVDs and videos. This is not just a library this is a family room, and I have to say there is a lot of competition for using it. Around the room are many pictures and ornaments, nearly all of them have some sentimental or historical significance for me. For example, statues of the six wives of Henry VIII, people might think they’re rather twee, but I think they’re lovely. 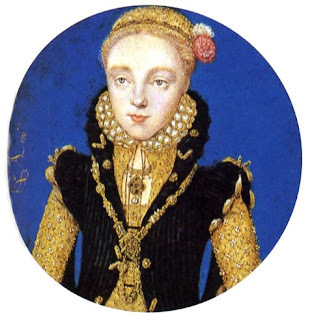 Pictures of my children are around; a portrait of my daughter, the six wives of Henry the VIII on Royal Dalton plates. The relief of Richard III up there reminds me of a lovely outing to Middleham Castle in Yorkshire, I’m passionately interested in that particular period; I wrote a book on the princes in the tower. Everywhere I look in this room there’s probably a story behind every object. I’ve been doing historical projects for many years now, this is the first and it is the one I am often asked about. It is a biography of Anne Boleyn and it was written when I was 15 and some of it is based on original sources. It was all written by hand, some of the pictures are now coming out, that’s one of the four penny postcards National Portrait Gallery. There’s an appendix with a letter from Anne Boleyn to Henry VIII in 1527, and from Anne to Wolsey, I even did an index. Certainly not suitable for publication. I work rather differently now from the way I used to. This book ‘Katherine Swynford’ came out in 2007 and these two lever arch files are the research for it. There are reams and reams all under date heading, so it’s roughly researched into draft and that was normal for any book that I wrote. A very good historian friend of mine said to me ‘why do you do your books that way? I do my books in a different way. I write a skeleton outline of the story and I do it on a word processor and I add in research and build it that way.’ And since then that’s the way I do my history books. Thank you for stopping by. Please feel free to leave any comments or questions!